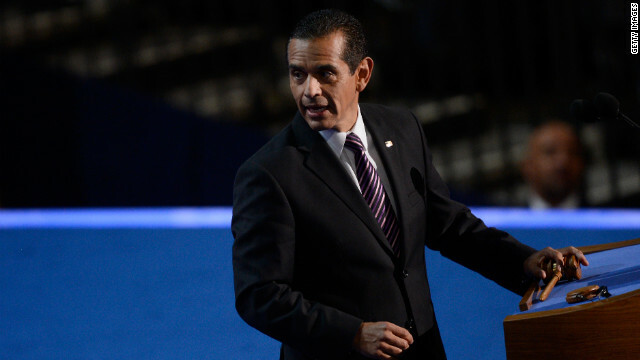 Los Angeles Mayor Antonio Villaraigosa is president of the Conference of Mayors. Los Angeles (CNN) - School teachers should be held accountable for the performance of their students, the Conference of Mayors said Tuesday, according to the group's leader. "The Conference of Mayors unanimously supports student growth over time as a measurement in teachers," said Los Angeles Mayor Antonio Villaraigosa, who presides over the conference as president. "That should be at least one of the elements of their evaluation, and if you ask mayors across the country, they will agree." The 59-year-old Democrat told reporters that the issues in New York and Los Angeles, the largest and second-largest public school districts in the nation, are similar to those in Chicago, the third-largest, where thousands of teachers have been on strike since Monday. "These aren't radical notions, and my hope is the parties will sit down and figure it out. The public wants to see more accountability," he said. With curiosity I watch as the Chicago Teachers’ strike unfolds, as they respond to the teacher effectiveness laws being implemented in Illinois and in other states throughout America. Unfortunately, they may be serving as the lightning rod for other urban school districts across the country. I was in 8th grade when I decided that I wanted to become a teacher. I remember reading an editorial describing the profession as noble, caring, stable, and secure. A teacher would never be wealthy, but would make a difference. Something inside me melted; I had discovered my place in the world. Armed with a scholarship and a National Defense Loan, I earned a college degree, certification, and believed I was prepared to impact lives-not bow before the idol of test scores. However, as we attempt to reinvent a school system dismantled by the innovative forces of technological change and the unruly winds of globalization, schools, job descriptions and lives are being redefined. Now teachers are required to teach problem-solving and cognitive flexibility to ALL students and are being held accountable through state-legislated accountability laws . Customarily, public schools have been least successful educating children of color, children of the poor, children of the chemically dependent, or the single, underemployed parent. However, public education is now expected to serve ALL children in the same way it has middle-class, white children from stable, two-parent homes. During the industrial era, the school’s mission was to graduate the masses from high school. The classroom was the sacred, untouchable domain of the teacher who served as the “soliloquizing authority” much like the foreman in the factory or a manager in an office. In an educational civilization created during a social and economic context (industrialization), schools and teachers were neither required to nor needed to educate ALL children equally and well. Designed to prepare students for life in the prosperous, industrial economy, schools taught and many still teach an invisible curriculum of rote memorization, physical quietude, punctuality, obedience, rigid uniformity. Teachers, too, were co-opted into a similar model. Punctual teachers with effective classroom management skills, (quiet students) low failure rates, positive rapport with parents, peers AND especially the principal earned tenure, a pension plan, and the good life. Alas, this model is gone with the wind. Working in concert, newly elected governors, federal policy incentives, and legislative bodies across America have spawned an unprecedented wave of legislation designed to create an Educator-Effectiveness Reform Model. Through mandating ongoing student assessment and linking the assessments to decisions concerning tenure, dismissal of underperforming teachers, and workforce reduction, educators find themselves in a performance-oriented culture. Now, teachers are viewed as accountable talent and are expected to perform like workers in profit-making industries. The bottom line is students’ test scores, soul-sucking assessments. However, corporate managers who supervise 50, 100, 150 or more personalities earn far more than the annual $70,000 of teachers. And they don’t run out of supplies/equipment needed to perform their jobs. Unfortunately today teachers are expected to do more with less. Teachers face a fire storm of neverending demands. Listening to troubling truths about students’ lives is interspersed with preparing lessons, checking papers, meeting with parents, keeping abreast of the educational research, and raising our own families . Teachers also encourage students to become valuable and indispensable contributors to society, meld content with character, cheer on risk taking and individualism. Though it’s an emotionally, physically, spiritually demanding work, teachers are criticized for working a ten month calendar. The summer sabbatical enables teachers to take classes for which they are not compensated and to recharge their batteries. The five year attrition rate hovers around fifty percent; in high poverty schools, it’s fifty percent every three years. Even the scholarly, energetic, and dedicated Teach for America corps fares no better survival rate. •	How do we re-conceive the role of parents who are the first teachers? “The hand that rocks the cradle is the hand that rules the world.” William Ress Wallace. •	Who will be responsible for birthing the character traits (maverick thinking, marching to a different drummer, curiosity, risk taking, etc.) ALL students need to compete in a global economy? •	How do we create school/community/classroom cultures where students learn to face failure, overcome mistakes, problem-seek, and confront conflict needed to succeed in an innovation-based economy? Only journeying down the student assessment and teacher performance-based paths without addressing this new, invisible curriculum means that poor students and children of color will be ill-equipped to participate in the new economy. As educators across America experience the death of seniority, stability, security of a once noble profession, educators travel uncharted terrain: A game change that holds teachers accountable! Nevertheless, how do ALL leaders best collaborate to give birth to these new responsibilities, to securing the goodwill of teachers, and to fostering SHARED systems of accountability among PARENTS, STUDENTS, COMMUNITY?